Wow! What a championship match between two great teams. It was clear early on that these teams came to compete, and that is exactly what happened. The Rainierdeers came out strong and never backed down for a minute. Everyone on the team seemed to possess an exceptional ability to pin point exactly where the balls would land, and when necessary, chased them down and kept them in play. These Rainierdeers are nimble like deer and have the agility and hustle to outrun any competition. Thanks for a great season Rainierdeers, and congrats! What to say about the new champs Air High Fives, except they are honest, have great spirit, and really are the best good guys that give great air high fives. This team fought out a tough Semifinal match against the Flying Squirrels and went on to take on the fantastic team, Two Hit Wonders in a championship match for the ages. Both of these teams are so much fun! 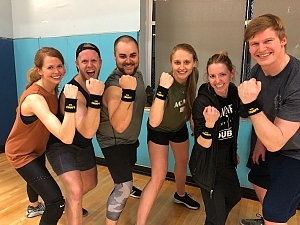 They shared in laughs throughout the entirety of the match, and in the end it was Air High Fives led by Captain Robert, that emerged victorious. Congrats Air High Fives! 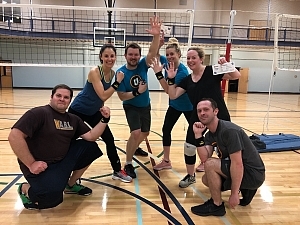 The team Night Court came out in true championship style last night and dug their way through a very close Semifinals match, and then a very fun Championship match. 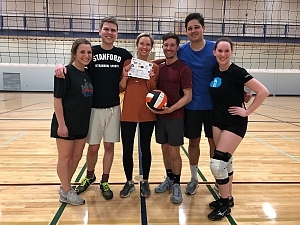 Led by team Captain, Christen, a blocking force at the net who never backed down from even the hardest hits, the Night Court folks were court ordered for victory. They had strong sets at the net from south paw, Jake, who also has one of the most graceful serves in the game, making this team a joy to watch. Perhaps most impressive is after two matches, this team ran out of the gym to fuel up, and play a third match over at First Baptist. Way to go Night Court! You are all awesome!